Championship side Bournemouth are reportedly looking at Callum Wilson as Lewis Grabban’s replacement as he heads towards a move to Cardiff City. Recently relegated Cardiff last week triggered a release clause in Grabban’s contract and The Cherries are acting quickly to bring in his replacement. 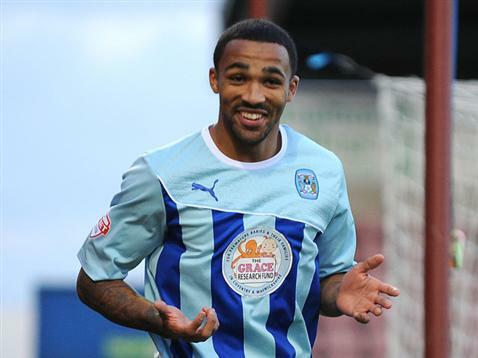 Wilson, 22, who only signed a new two-year contract with The Sky Blues in October, scored 21 goals in League One in 2013/2014 and was named in the League One Team of the Year. Both Wilson, and City manager Steven Pressley have spoken publicly about how they expect Wilson to be in a City shirt next season but it’s unclear with Financial Fair Play rules how tempted the club would be to cash in on it’s prized asset if Bournemouth tabled a significant bid. If Wilson was to leave, it would leave Pressley without both of his main striker from last season, with Leon Clarke having jumped ship to Wolves in January after forming a deadly partnership with Wilson. « Jack Finch signs first professional contract.